This piece is perfect to add elegance and sophistication to any room. If you are looking for a dynamic, three-dimensional piece of art that will energize your home, office, or garden- this is IT!. Also makes a great gift! 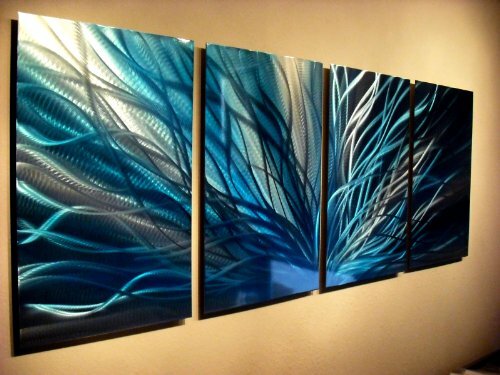 The details hand sanded into this Abstract Metal Wall Art & Sculpture capture the interplay of highlights and shadows and creates a three dimensional sense of movement as you view it from different angles. Pictures do not do it justice since the highlights and shadows change as you move around it. I hand polish and grind the textures into the metal to create dramatic illusions of depth and dimension. The silver reflections will be especially appreciated in person as you and your guests marvel as the brilliant glimmering light seems to interact with the metal as you move around it. Each piece is meticulously fabricated when the order is placed and will vary slightly from the photos shown (the new pieces always look better than the photos). I use the highest grade materials to bring many years of enjoyment and mounting brackets are installed to allow hanging on any surface. It usually takes about 7-10 working days to create the piece and allow it to dry completely before shipping. Mounting brackets and hardware are included along with easy to follow mounting instructions. All Aluminum Construction- Blue, Dk Blue, Silver. TAKE NOTE! This is an ORIGINAL design and creation by Miles Shay and ONLY Miles Shay Metal Art is authorized to sell it. All other sellers are COUNTERFEIT! Note the "Sold by" SELLER NAME above the "Add to Cart" button must be Miles Shay Metal Art. If you purchase from another seller you are most likely being scammed!!! No other sellers are going to be hand created and signed by the original artist. If you have any questions about this product by Miles Shay, contact us by completing and submitting the form below. If you are looking for a specif part number, please include it with your message.